Episode 18 - This is a longer, pithy episode, covering the way the brothers decided to prevent future conflicts over their shared wife, and Arjun's subsequent adventures when he breaches those rules. Despite the punishment he receives for breaking the oath he swore, Arjun ended up having a lot of adventures and getting to know a lot of hot princesses around India. Draupadi would have been better off keeping him closer to home! So Arjun ends up coming back from his year-long exile with a new wife-- Krishna's sister-- and leaving a trail of baby boys across the sub-continent. After his return home, he and Krishna spend a lot of time together in Indraprastha, and we are told that they are the re-incarnation of the ancient seers Nar and Narayan. While they are hanging out together, Krishna suggests that they go to the river for a kind of picnic, and while they are there, Agni the god of fire meets them and requests their aid in burning down the Khandava Forest, which was the home of Taksaka the snake and under the protection of Indra. Arjun and Krishna get some cool new weapons as part of the deal. Arjun gets the famous Ghandiva Bow and an inexhaustible quiver of arrows. Krishna gets his Sudarshana discus. The pair of friends then help the Fire God to burn down the forest, fighting off legions of magical creatures and even an army of Gods. It is interesting that Arjun's marriage to Subhadra was in large part the result of Krishna's suggestions. I also noticed that the pair were sitting near the forest where they could meet the Fire God due to Krishna's suggestion that they have a picnic. I'm going to keep score on this and we'll see just how much of this story moves along due to Krishna's well-placed suggestions! It's going to be a lot!!! 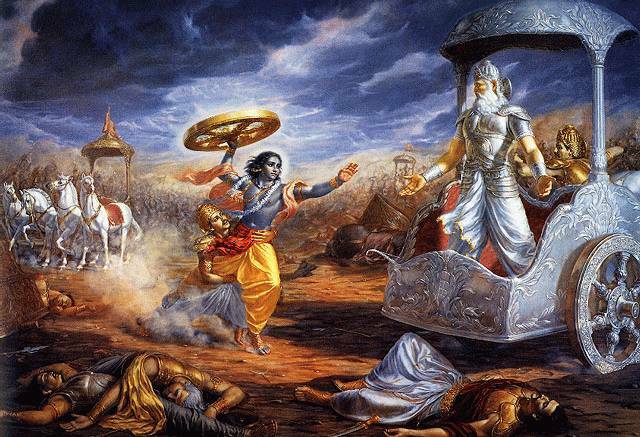 This episode actually covers the end of Book 1 of the Mahabharata, called the Book of the Beginning. There are 18 books in total, and we'll start Book 2 next time, which is called the Book of the Assembly Hall. In case you were not able to figure it out, I did start using some of the alternate names for Krishna and Arjun in this story. Some of Krishna's alternate names are: Vasudev & Madhusudana. I refer to Arjun as Partha, Dhananjaya, and Gudakesha. I found your Podcast by Learnoutloud.com and loving it. downloaded all the existing one and listining them and looking forward to more. I first thought if god of fire had all these weapons in armoury, why did not he destroyed the whole forest by himself? Anonymous: Sorry, that was a typo! I corrected it in the post. Rest assured I got it right in the audio... Thanks. The story just transports to an era where things happened with might, reason and honesty. Totally loving it. Thank you fur putting this up Lawrence. THe time is totally worth it.